On a summer Saturday in St. Paul, Minnesota, a farmers market was busy with shoppers. The market has many loyal customers who know they can find locally grown fruits and vegetables, as well as handmade cheeses, meats, honey and other products. Alyssa Erding is among the buyers. "I love that I get to talk with the people who are growing my food. I feel really good knowing that I know where it came from and it came from somewhere close and somewhere that I consider to be home." 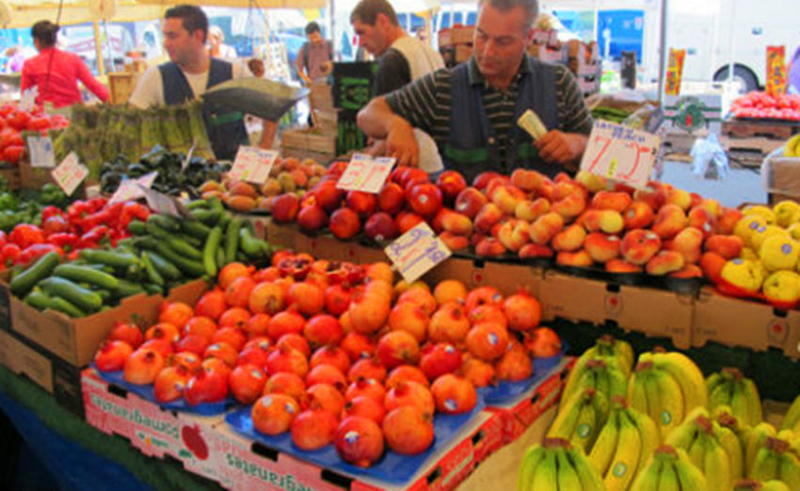 The St. Paul market only sells fruits and vegetables grown within 80 kilometers. And it does not permit middlemen. In other words, the growers are the sellers, too. Mike Gerten's family began selling vegetables at the market more than 150 years ago. "My family came from Germany and Denmark. I was born into the truck driving business. I took over from my father and we go back for at least four generations on the St. Paul Farmers' Market. We started when it started." The market is much the same as it was in 1854, the year it opened. That was four years before Minnesota became a state. At that time, the town built a small brick building to house the first public market. It offered vegetables in season, breads and milk products. As America grew and modernized, people stopped going to farmers markets. They favored big food stores. But in the last 40 years, farmers markets have had a renewal. The U.S. Agricultural Department says there were about 1,755 in the country in 1999. Now, they number over 8,600 the agency reports. In St. Paul, the arrival of Hmong refugees in the 1970s and '80s gave the market a second life. The Hmong came from Vietnam, Thailand and Laos, cultures where nearly everyone shops in outside markets. Farmer Der Thao was born in a refugee camp in Thailand. Her father is from Laos. "We've been at the farmers market for over 30 years. So this is pretty much our second home here." Hmong growers make up 50 percent of the market's sellers now. "The business is really good," said Thao. Other immigrant farmers have joined the market more recently, like Susan Dahl. "I came from Nepal in 1997. I sell raw honey. That's what we produce. We have hives. And I love being with the people and I enjoy being in the market, feels like a home." Somali seller Hibo Egeh joined the market last May. "I make some different hot sauces. Some of them are from my country flavors and background and the rest is something that I created for my family." Shopper Ryan Rapazz praises the product. "I just bought a Hibo hot sauce from a Somali vendor. In addition to wanting to buy it because it's an absolute excellent hot sauce, we come here to support local farmers and local vendors who is from the immigrant community." The U.S. government has helped with the growth of farmers markets through a financial assistance program. Since 2006, the Farmers Market Promotion Program (FMPP) has worked to increase the purchase of locally grown fruits and vegetables. It also wants to create new market possibilities for American farmers. But money for the program is not included in the 2019 federal budget, which may affect small markets around the country. Jim Golden directs the St. Paul Growers Association which runs the market. He says there is something magical about the place. "It feels like a family here, it feels like a big family with all the growers and it feels like a big family with all the customers. And you see people over years and years and years and years, it works here." Your wife as well as you is friendly to me. A sandstorm in a refugee camp near the border of Somalia. I can’t go back and end this now. 5.In other words, the growers are the sellers, too. In other words, he came out of the closet. 6.In addition to wanting to buy it because it's an absolute excellent hot sauce, we come here to support local farmers and local vendors who is from the immigrant community." In addition to the killed and wounded, many were missing.